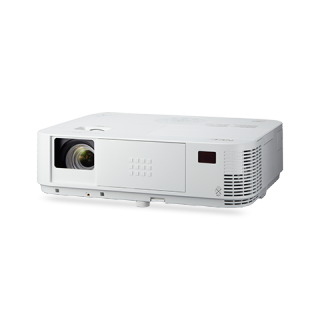 NEC Display Solutions of America announced the new M402H projector, a full HD, entry-level installation projector for digital signage applications in schools and colleges, corporations and small- to mid-sized businesses. The single-DLP chip projector uses internal processing capabilities to render the same color levels as LCD projectors, crucial for users working in color-critical applications. Up to 8,000 hours of lamp life and a sealed optical engine that prevents dust from gathering on the panel also provide years of lower maintenance. Meanwhile, horizontal and vertical keystone correction squares-up images when the projector is set up at an off-angle to the screen. Besides connecting to computers, laptops and other video equipment through standard connections, the M402H also allows connections to tablets, other smart devices and even local area networks – wired and wirelessly. The M402H projector’s built-in access point also removes the need for a laptop when using NEC DisplayNote Software, which lets educators, students and professionals present and share content across any device using Windows, IOS and Android operating systems. The M402H projector ships with a 3-year limited parts and labor warranty, and will be available in September 2014 at an estimated street price of $1,199. Lamps are covered for 1 year or 500 hours, whichever comes first.